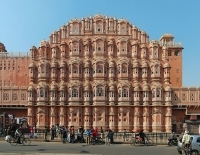 The Pink City, Jaipur, is known for its palaces: it was once the home of the richest royal family in India. 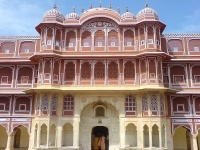 The City Palace, Palace of the Winds and Amber Palace are all ornately decorated and popular attractions in Jaipur, and they are usually the first stops on sightseeing tours of the city. 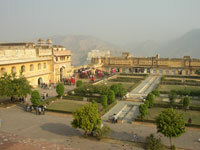 Other places of interest in Jaipur include the Galta Monkey Temple, a ruinous but alluring Hindi temple lodged between two granite cliffs; Nahargarh Fort, the best site to enjoy sunset views of the city, perched on a high hill above Jaipur; Jaigarh Fort, a perfectly preserved medieval fortress with impressive military artefacts; and Jantar Mantar Observatory, an intriguing collection of structures to measure weather and astronomical phenomena, built in the early 18th century. Jaipur is also celebrated as a great shopping city, and its many markets and bazaars are considered some of its top attractions. The vendors and market sellers in the city offer a great variety of goods and visitors will be expected to bargain for a good price. Gemstones, clothes, jewellery, and distinctive blue pottery are all readily available. The best places to shop are the Gem Palace, Chameliwala Market and Amrapali. There are a variety of fun ways to explore this city: walking tours are popular and a good start, but there are also more exciting options for the adventurous, like an elephant ride, or a tour of the city from above in a hot air balloon. Jaipur, like most Indian cities, has a problem with traffic and getting around can be stressful but there are many tours on offer, and locals are always willing to give directions. We are looking for contributors for our Jaipur travel guide. If you are a local, a regular traveller to Jaipur or a travel professional with time to contribute and answer occasional forum questions, please contact us.